The Blessed Trinity girls spoiled Starr’s Mill first-ever finals appearance and clinched a third-straight state title of their own Saturday at Kennesaw State University’s Fifth Third Bank Stadium. In the first of four state championship matches, the Lady Titans jumped out to a 9-2 halftime lead and closed out a 15-7 victory to take the Class 1A-5A crown. Blessed Trinity’s Elise Hammelrath finished with four goals, Abbey Sokol and Kelley Scot each added three and Lizzy Murphy had a pair of scores. Eleven-time state champion Milton survived an 11-10 scare against Lassiter in the girls Class 6A-7A finals. Heading into the match, Milton had defeated the Trojans in all 15 previous meetings. Lassiter led for the entire first half until Milton’s Skylar Carrasquillo’s second goal put the Eagles up 6-5; her sister, Brianna Carrascquillo, netted a first-half hat trick, and Elizabeth Harrison led Lassiter with four goals. Milton’s Erin Degnan opened the first-half scoring before Brianna’s fourth goal put Milton up 8-5 with 21:47 left. Lassiter pulled within 9-8, but Milton increased the lead back to 11-8 with 8:25 left on Brianna’s game-high fifth goal. Lassiter got back within a goal with 1:31 remaining, but the Eagles held on and hoisted a sport-record 12th state title. 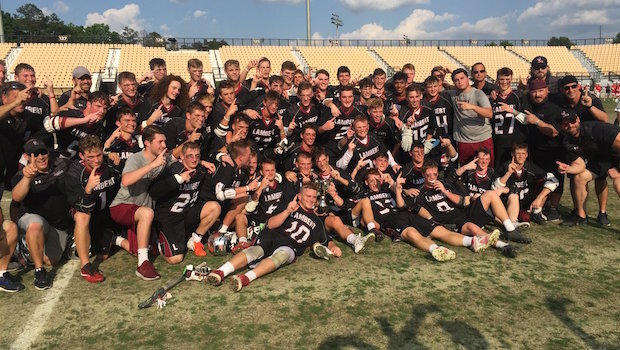 Defending boys Class 6A-7A state champion Lassiter fell 12-6 in a rematch of last year’s 10-5 championship win over Lambert, as the Longhorns celebrated a perfect 22-0 season, redemption and a fourth all-time state title. The Longhorns opened up a 6-2 halftime lead and took a 9-4 lead into the final frame. Gerard Kane led Lambert with five goals, and teammates John Michael McCormick and Andrew Atchison each finished with a pair. Blessed Trinity and Greater Atlanta Christian both played for their program’s first championship in Saturday’s finale, but it was Blessed Trinity that rallied in the second half and capped the game with three straight goals to capture the Class 1A-5A state title with a 6-5 victory. Greater Atlanta Christian opened the second half with a 3-2 lead and Ethan Holthaus scored with 4:43 left in the third to put the Spartans up 4-2. Blessed Trinity pulled back within a goal late in the third quarter and then evened it up 4-4 early in the fourth quarter. Goals by Thomas Higgins and John Solar put the Titans up 6-4. Greater Atlanta Christian’s Michael Malone capped the scoring and registered a hat trick with three minutes left, and Blessed Trinity held on for the win. 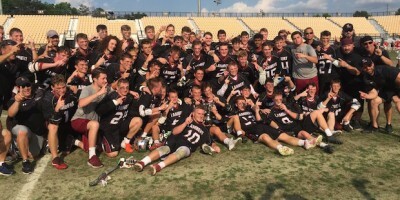 No Replies to "Blessed Trinity sweeps, Lambert boys and Milton girls clinch Class 6A-7A titles"